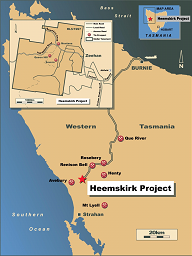 The 100% owned Heemskirk Tin Project comprises three closely spaced tin deposits, Queen Hill, Severn and Montana located on the northwestern boundary of Zeehan. Tin mineralisation occurs as cassiterite (SnO2), the metallurgically most productive form of tin, within a broader zone of iron sulphide (pyrrhotite and pyrite) mineralisation. The vein, stock-work and replacements styles of mineralisation most closely resemble that of Renison Bell, Australia’s oldest and richest tin mine which is located 18 kilometres to the northeast in a similar geological setting to Heemskirk. The most recent Mineral Resource estimate of 6.28 million tonnes at 1.14% tin was published in February 2013 and represents a 49% increase to 71,500 tonnes of contained tin on the previous estimate from October 2011. In July 2013, Stellar completed a prefeasibility study based on the upgraded Mineral Resource. The study demonstrated technical and economic feasibility of an underground mine producing 600,000 tonnes of ore a year for the recovery of 4,327 tonnes of tin in concentrate in a standalone processing plant. The pre-production capital cost estimate of US$114 million includes US$34 million for mine development, US$68 million for a processing plant and US$12 million for a tailings dam and contingency. The Heemskirk project is also expected to have direct cash production costs of US$14,438/tonne of tin in concentrate which places it in a competitive position on the global tin industry mine production cost curve as defined by the International Tin Research Institute. 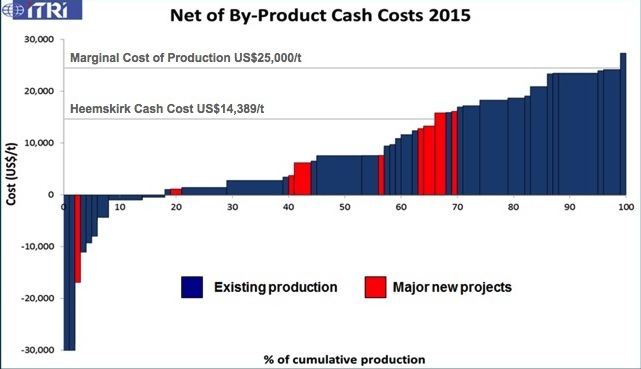 As the cost curve shows, Heemskirk’s estimated cash cost is almost half of the US$25,000/tonne long-term marginal cost of tin production. The information in this report that relates to Mineral Resources is prepared in accordance with the 2012 Edition of the ‘Australasian Code for Reporting of Exploration Results, Mineral Resources and Ore Reserves’ (“JORC Code”) by Tim Callaghan of Resource and Exploration Geology, who is a Member of The Australian Institute of Mining and Metallurgy(“AusIMM”), has a minimum of five years experience in the estimation and assessment and evaluation of Mineral Resources of this style and is the Competent Person as defined in the JORC Code. This report accurately summarises and fairly reports his estimations and he has consented to the resource report in the form and context in which it appears.